A guacamole BLT transformed into crostini hors d’oeuvre. Photo courtesy California Avocado Commission. What’s better than a BLT? Well, there’s a turkey BLT and our favorite, the chicken salad BLT. And then there’s the guacamole BLT. 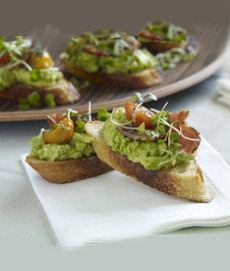 Guacamole can be added to any of the above; or turn the concept into bite-size crostini—BLT appetizers. Microsprouts stand in for the lettuce; or you can substitute arugula, watercress or other flat lettuce. This recipe was developed by Deborah Branby, chef/owner of The Cheese Board in Reno, Nevada, and provided to us by the California Avocado Commission. We’re serving it on New Year’s Eve. 1. Brush one side of the baguette slices with melted butter. 2. Bake at 375 degrees F until lightly toasted, about 15 minutes. Cool. 1. Slice tomatoes in half and toss with olive oil. 2. Roast at 400 degrees F until lightly browned, about 15 – 20 minutes. Cool. 1. Mix together mayonnaise and fresh lemon juice. 1. Coarsely mash the avocado and mix it with the fresh lemon juice. 2. Top each crouton with 1 tablespoon of the mashed avocado mixture. 3. Top with 2 thin strips of bacon, micro sprouts, lemon aioli and roasted cherry tomatoes. 4. Drizzle with pesto. Serve immediately.